Explain how to set up a Test Drive. List the types of orgs involved in a Trialforce setup. Describe the process of configuring the orgs for a Trialforce setup. Let’s investigate the different types of free trials Salesforce makes available. Suppose we have a great product called Volunteer Tracker that does just what the name says: it tracks volunteers for an organization. Let’s see what kinds of experiences we can create for our prospective customers. We’ll deploy a trial of each kind for our app: an installable trial, a Test Drive, and a Trialforce trial. We mentioned earlier that the license makes all the difference between a trial and the full version of an app. Before you set up a trial, you must associate it with a license. Do this by linking the managed package for your app with your License Management Org (LMO). The LMO is the org where you installed your License Management App (LMA). You need both an LMO and an LMA to capture leads from your prospects. 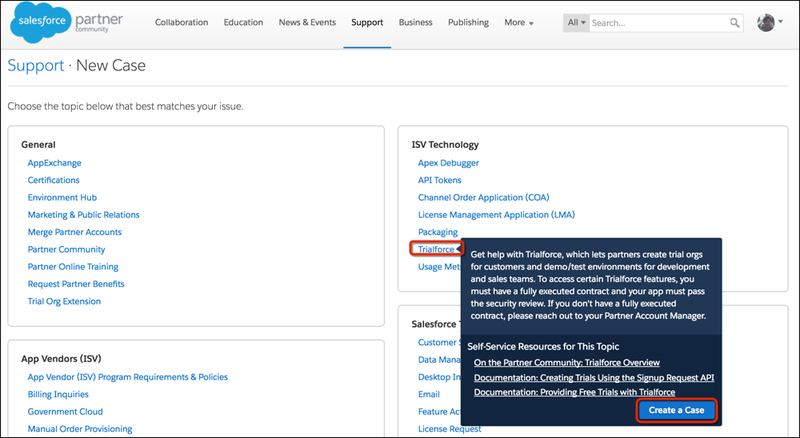 From the Publishing tab in the Salesforce Partner Community, click Packages. Find the package for the app. In our case, this is Volunteer Tracker App. Click Manage Licenses. Enter the login credentials for your LMO, and click Submit. Select a free trial for your default license. Enter the length of the trial license in days. If you want, you can even select License does not expire. Enter the number of seats for your license, or select License is site-wide to offer the license to all users for your prospect’s organization. From the Publishing tab, click Listings. Click your app’s listing, and click Leads. Select Collect leads when customers interact with this listing. Now our trials will feed us leads! Let’s set up the trials. Installing our app into a customer’s org is simple. Begin from the Publishing Console in the Salesforce Partner Community. From Publishing Console, click the Listings tab. Click on your product listing. Under “How should customers install your app?” select the option that works best for your business case. For installable trials, installing directly from AppExchange usually works best. We discuss the other options later on. Under “Offer a trial installation,” the License Management App (LMA) license reflects the settings you selected when you linked your managed package with your License Management Organization. That’s it. If you selected the “Directly from AppExchange” installation option, a customer sees a green Get It Now button on your AppExchange listing. Clicking Get It Now takes the customer through a wizard to select whether to install your app into a production or sandbox org. The app is installed to the org, and customers can try it out with their own data. Easy-peasy. 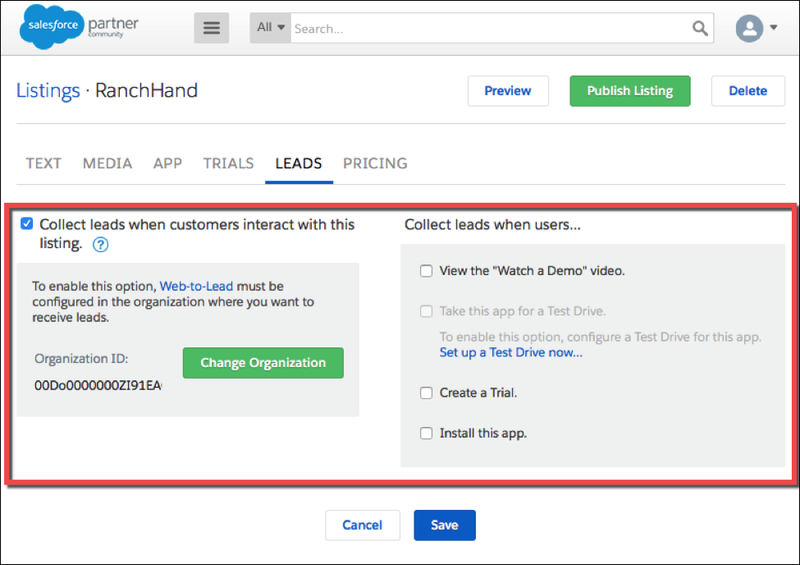 Test Drive is the easiest way to show Volunteer Tracker to customers who don’t use Salesforce. They start a Test Drive of the app from its AppExchange listing. The Test Drive lives in its own org, and every customer who uses it is logged in as an evaluation user. Customers can’t change any of the data in the org, and they don’t need a password. Several customers can use a Test Drive at the same time—since no one can change data, there’s no risk of interference. 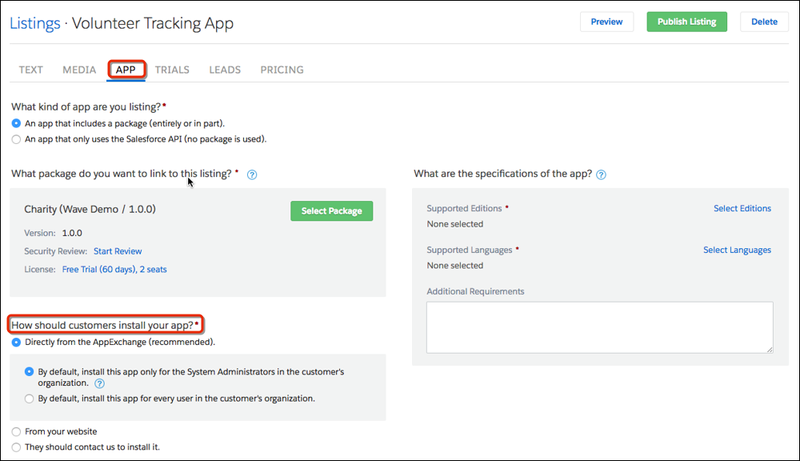 Before you create a Test Drive, make sure you’ve linked a managed package for your app to your listing. We explain how to do this in the ISVforce guide. Start from the Publishing Console in the Salesforce Partner Community. A wizard pops up. Give the Test Drive a simple descriptive name, and associate it with the right version of your app’s managed package. Then click Submit. 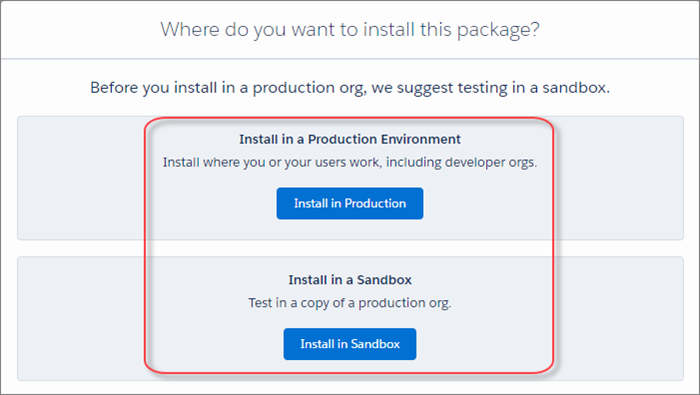 Salesforce creates a Developer Edition org for the Test Drive. This org has two users: an administrator and an evaluation user. Salesforce sends you an email for each of these users. When you receive the emails, you’re ready to configure the org. 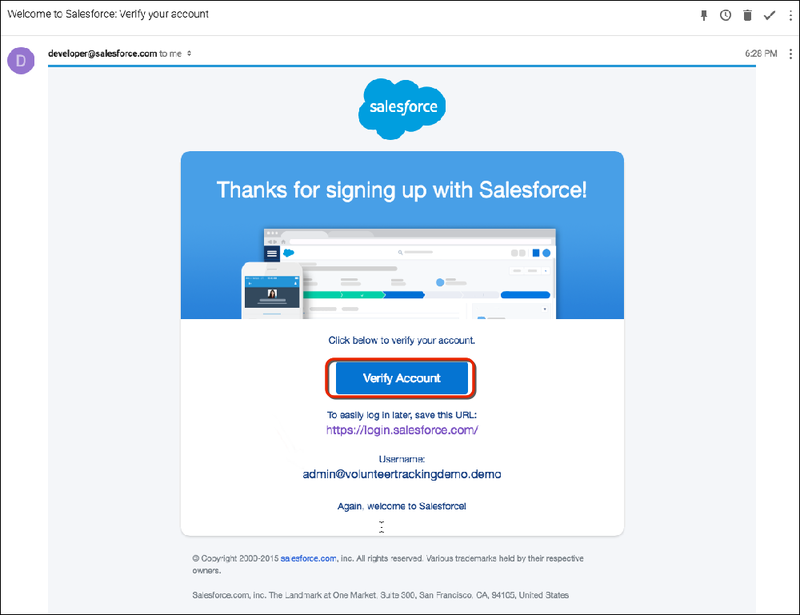 Open the “Welcome to Salesforce: Verify your account” email for the administrator user and click Verify Account (1). A wizard guides you through the steps to change your password. Add sample data and configure the org so your application is ready to go. Great sample data helps you sell your product, and we discuss it in the next unit. 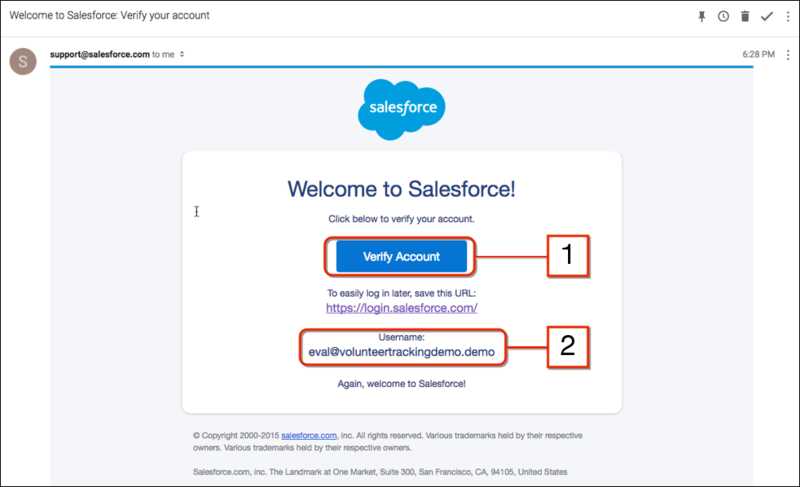 Open the “Welcome to Salesforce: Verify your account” email for Evaluation User and click Verify Account (1). Then follow the directions to verify your account and change your password. Log in to the Test Drive org as the evaluation user (2) and make sure you can access your app. If you can’t, you must assign this user to a license for your managed package. The Test Drive org is ready to go. Now it’s time to link it to your listing. Begin the process from the Publishing Console in the Salesforce Partner Community. A wizard pops up. Provide the username and password for the read-only user and click Submit. The username must have “eval” in it. Your customers can now take your product for a spin. Go to your AppExchange listing and try it out by clicking Test Driveon your listing. Trialforce is pretty cool. As our most flexible free trial, it lets you create several different experiences for different types of prospects and customers, running each one in its own trial org. And conversion is easy, since customers who buy your product just start using the trial org as a production org. Trialforce isn’t magic, though. You have to know a few things and configure some orgs to get it to work. But don’t worry. We’re here to show you how. For each experience you provide in Trialforce, you create a template that holds configuration data and sample data. The data in this template gets deployed to a trial org when a prospect starts a Trialforce trial. A Trialforce Source Org (TSO) holds the configuration and sample data for a template. You make one of these orgs for each experience you create, configuring it exactly as you want your prospects to see it. The TSO creates templates that contain your configuration and sample data. Your Environment Hub can create a TSO for your trial. This is the easiest way to make a TSO. A Trialforce Management Org (TMO) is what you use to create and manage your TSOs if you want custom branding for your trial. The Environment Hub can’t create branded TSOs. We show you how to create a template for a TSO in the next unit. For now, let’s set up these orgs. Log in to your Environment Hub, which is installed in your business org. Enter required information and click Create. In order to create a branded TSO, you need a TMO. And for that, you need an existing Developer or Partner Developer Edition org. This can be any org except the one you use for managed packages. If you need a new org, you can create one from your Environment Hub. Once you have the developer org, create a support case to get access to a TMO. From the Publishing Console, click Support (1). From Subtopic, select Trialforce Management Org. Select a severity level, enter a brief description, and click Submit Case. That’s it. You will receive an email with login details for your new TSO. However you create it, you need one TSO for each different Trialforce experience you create. Hopefully all this talk about TSOs and TMOs isn’t TMI! (Too much information.) In the next unit, we focus on creating an effective Trialforce experience.